Stub out smoking for good and start improving your overall health this National No Smoking Day (13 March). There are 17,000 smokers in Richmond upon Thames. And though smoking is the single biggest cause of preventable death, research shows that you are up to four times more likely to quit successfully if you use a local stop smoking service. Free local support is available in Richmond upon Thames through the council’s Stop Smoking Service. Specialist advisers can give you products to use, such as patches and an inhalator, and can offer you regular support and information, whether you smoke cigarettes, e-cigarettes or other tobacco products such as shisha. 226 people have been helped to quit smoking through our Stop Smoking Service over the last twelve months. “Taking the step to stub out for good and kick your smoking habit will have immediate effects on your overall health. Evidence shows as soon as you give up, your blood pressure is reduced, blood circulation improves, breathing becomes easier, and your skin looks better. 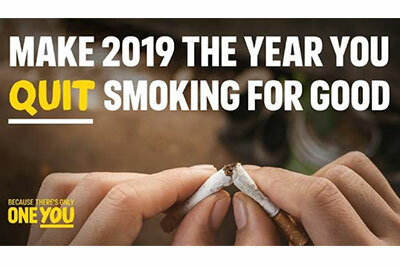 You can access the Council’s personalised Stop Smoking Service online, by emailing stopsmoking@richmond.gov.uk or calling the 24hr helpline 0800 011 4558. Specialist advice is available in pharmacies and GP surgeries borough-wide, and there are drop-in clinics that anyone can visit without an appointment at the Civic Centre every Tuesday 12 noon to 2pm. To access the pan-London anti-smoking service you can ring the helpline on 0300 132 1044 between 9am and 8pm Monday to Friday and 11am to 4pm Saturday and Sunday and get one-to-one support from a trained adviser. The online portal also provides additional information about other stop smoking services in our area. If you are a journalist and would like further information about this press release, contact Lyle Skipsey on 020 8487 5182.